BTC -Real ID is going forward this Winter via Secure Flight. There. I said it. "The TSA, which is implementing the next phase of its Secure Flight Program on Monday, will require that all passengers provide their full names as they appear on a current government photo ID, their date of birth and their gender." And to reinforce this message, the public is now getting glazed in anxiety, erhh, terror. It's so easy. We fall into predictable ruts of listening to 15% of the correct story. What am I talking about? Secure Flight is guaranteed exploding drama uttered from the sweaty fat guy who routinely waterboards the facts in FM spittle and throws them into solitary confinement where no one can get to them, because it's a "national defense" problem. DON'T YOU BELIEVE IN DEFENDING, AMERICA? DON'T YOU?! Federal grants from DHS to go along with federal benchmarks for the national identity program were way too tempting in a stuck economy to the airports and local governments. Real ID regulations became increasingly anchored through the tacit web of bureaucracy. Alas - here we are. The short story: The activists didn't report to work because there was no income to sustain them. The public got distracted with elections, flaming immigration and paralysis of analysis. 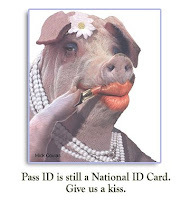 The think tanks, the advocates, the lawyers and civil libertarians were talked into leaving Real ID for dead; while lunging against perils of biometric ID cards heaved on the tenuously employed and cybersecurity power grabs. Where do we go from here? Well - We The People, pledge the survival of Numero Uno. 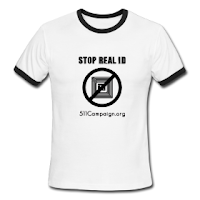 It's the weirdest logic ever when I look around at a sea of grass rooted in political upset, fiscal depression and insulted intellect to been told, there is no grassroots movement against national ID cards. That is exactly the kind of Jedi mind trick that is falling pancake flat on the campaign trail. If I were presumptive government, regardless of party - I would still fear the base. When you have people who don't have anything left and are left with nothing to lose - get ready for revolution. I mean the "I don't fear your jails" kind of revolution. I begin to wonder what a truly privatized American facist society would look like. I think the next step in the tour of the absurd should include an infomercial sponsored by The New American Closed Society. "And for 12 mandatory installments of $19.99 you get the benefits of safety and job security against Mexico's terrorists by building America's Largest Southern fence! But wait! That's not all, if you lay down and express exactly no resistance to this tax expense plan you get, at no additonal costs: a predator drone, a personal security contractor to check on you whether you need him to or not, and a splendid catalogue of high tech secured identity cards- just like the CIA and other top secret officials! This goes for health, banking, shopping-- and uh-oh! Yes, when you have to make a pit stop to visit any federal building in America. One of our customer specialists will take your fingerprints, DNA, RNA from hair, urine, saliva, health records, to your driving records, bank records, shopping records and anything else you need to streamline the permission process for daily living in the safest, securest America yet! And it's all because of you! Thanks, America." Don't agree to go along with this. Don't agree to pay for it. Find alternatives to enduring Americas emergent gestapo, the government entitled contractor class, by using alternate transport. Boycott the airlines this Winter. Leave the TSA with no one to defend or protect so they can pack up their X-Ray machines and sell them to China. Their people don't mind as much. "City officials plan to launch a pilot program today to make it easier for some public school students to use city services by providing them with one card they can use to ride the MBTA, withdraw books from city libraries, play sports, attend after-school programs at community. This program is starting at the Josiah Quincy Upper School in Chinatown, where all 530 students in grades 6 through 12 are being provided a card, which has multiple barcodes, a radio frequency device to use on the T, and their photos. " "Northrop Grumman and the U.S. Department of Homeland Security's Federal Emergency Management Agency (FEMA) recently coordinated a nationwide demonstration showing the ability to deploy a common, interoperable credentialing system that enables electronic identity authentication for government and industry personnel." "Individuals and organizations utilize secure, efficient, easy-to-use, and interoperable identity solutions to access online services in a manner that promotes confidence, privacy, choice, and innovation." Do we want this? I believe the public asked for an additional 90 days to evaluate the program.